Are you searching for some hair styling secret weapons? Then you are in luck because our friends at Redken 5th Avenue have sent me some of their award-winning styling products for this review and giveaway that will make that hair look like you just walked out of a salon. I can’t wait to tell you about what I discovered using this selection I was sent that could handle a variety of different hair needs. Even though I have thick, not thin hair, my hair has some layers cut into it to take advantage of my natural wave and curl. As a rule, I prefer volumizing mousse to other varieties because it plumps up the layers to make most of my curls. When I tried the Full Frame 07 Protective Volumizing Mousse, I found the polymers in this formula really made by curls even fuller with this all-over volumizing ability. In addition, my hair felt softer and free of that hardness or sticky feel that some similar products can leave behind. I liked how long my curls stayed so full without drooping throughout the day. In fact, it was raining when I went out and my curls were still there later when I returned home. Next, I tried the Water Wax 03 Shine Defining Pomade on my side swept, layered bangs. I have this awful cowlick that always gives me trouble. This section of my hair needs the strongest product to keep it out of my eyes and dealing with it can often be like forcing back the wind. What I really liked about this Water Wax 03 was it had the power to actually subdue my cowlick better than I had ever expected and added wheat protein for strengthening my hair as well. The mico-emulsifers for moist control were wonderful to prevent any stickiness while the mica added shine. My feathered bangs stayed put and gave me nice control without weighing my hair down with too much product while the humectants kept it softer to the touch than turning hard like a shell. If this worked so well with my stubborn cowlick, I can see how fantastic Water Wax 03 would be for more dramatic, bolder styles without worrying about how to wash it out. Trust me, but you will understand after you use this yourself why this product won awards. A different time I tried Redken’s new Powder Grip 03. This is a mattifying hair powder that you only need a tiny amount to give you a more tousled texture like having a volumizing product and hair spray in one, to change your style. All I did was to shake a littleof this Powder Grip 03 into the palm of my hand and worked it to the roots. After I grabbed my curling iron and brushed, my hair had some pretty lift and hold quickly. I tried this stuff without following up with the curling iron and my style was a looser sort of curl. This would be great to help achieve an updo style. Last of all, I tried their award-winning Forceful 23 Super Strength Finishing Spray. This is perfect for delivering total hold and safeguarding your hairstyle when humidity strikes with the antioxidants such as vitamin E in this formula. What else I noticed was this spray left my hair free from any residue or flakes and I didn’t have to worry about this fading my hair color while my hair gained a brilliant shine. You can brush your hair later in the day and this product still keeps that style in check without fear of those curls drooping. What else could you possibly want in a hair spray? 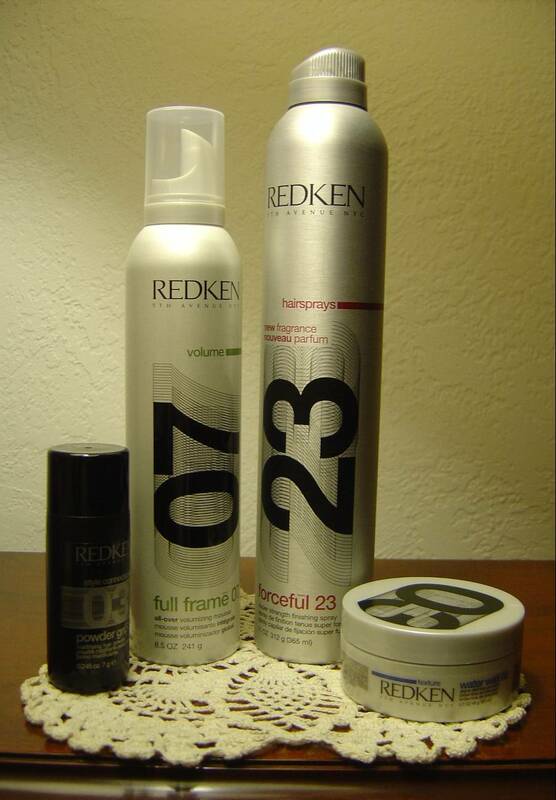 Seriously, I loved these Redken styling products and will be buying them again. I honestly recommend checking them out and especially that Water Wax 03 if you have problem hair like mine because these can help keep you beautiful. Thanks to Redken 5th Avenue, one lucky Nuts 4 Stuff reader in the United States wins the entire four full size Redken styling products: Powder Grip 03 (0.245 oz.) $18.99; Full Frame 07 Volumizing Mousse (8.5 oz. ), $16; Water Wax 03 Shine Defining Pomade (1.7 oz. ), $17; and Forceful 23 Super Strength Finishing Spray (11 oz. ), $16.50 for a total value of $68.49! This giveaway ends February 10, 2012 at 12 PM Eastern Standard Time. The winner will need to respond to my email with name and shipping address within 48-hours or another winner will be picked. Next Post Want a Quick Topping for Your Casseroles? I follow you on GFC as rusthawk. I'd love to try Redken's Soft line, including Gold Glimmer perfecting shine treatment. I would love to try their water wax for texturing! I follow on gfc and I would like to try the Color Extend Shampoo. I would like to try the GUTS 10 VOLUME SPRAY FOAM. I learned that Redken is currently sold in 58 countries across the world. I tweeted the requested message on Twitter at https://twitter.com/#!/likwan/status/168013788069638145.